Richard Craker's Cherokee name, Noksi Galaginais, which means “Star Buck". ​He is a Chickamauga citizen and recognized as a Holy Man of the Northern Cherokee Nation. Richard is an artist and has had fifty-seven drawings published in books about Indian religion and history. He has been involved in over twenty-five art exhibits and been shown in over twenty different galleries. He is a graduate of Southwest Missouri State University where he majored in fine arts with emphasis in Print Making: intaglios, mezzotint, etchings, and lithograph. Richard now has a small studio in his home in Joplin, Missouri. Serious patrons can contact him by phone at 417-553-5224. Gloria Faubion is famous for her beadwork. She has a reputation for colorful and creative bracelets and necklaces. Lovingly called "Mama" by many tribal members, Faubion incorporates Native American heritage into her work. Gary "big standing bear" Raymo is a nationally recognized craftsman and artist of tribal jewelry, decorative masterpieces, and regalia accessories. Many of Gary's pieces are commissioned designs. He, along with his mother Gloria Miller who is also an artist, will be participating in the annual Homecoming Pow Wow and Cultural Gathering and have items on display and for purchase. Gary donates a portion of the sales of his beautiful artwork to help support his tribal family. “I wanted something special like Big Standing Bear has made for himself and wears to tribal functions,” stated Dobbs. “He knew I had an appreciation for buffalo so he incorporated buffalo teeth into the piece,” Dobbs continued. In addition to four polished buffalo teeth, Big Standing Bear included African turquoise which is in the jasper family. The white beads are called “bone hair pipes” and the silver beads are nickel while the black beads are hemalyke. The popular hemalyke is a mirror-like metallic black “stone” which is a look-alike for natural hematite. 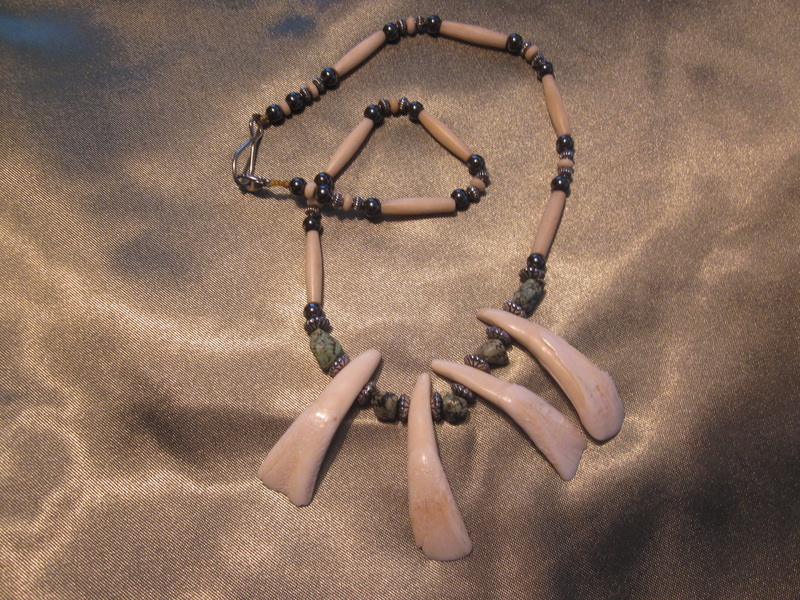 The small round white discs in the necklace are bone, as well.